Early outpost against Indians. Used by Gen. Rutherford in expedition against Cherokee, Sept., 1776. Stood nearby and gave name to this town. Built by colonial militia, the fort along the banks of Mill Creek in present-day McDowell County was among North Carolina’s westernmost outposts until 1776. Known over the years as Upper Fort, Catawba Fort, and more commonly as Davidson’s Fort and Old Fort, at the outset of the American Revolution, it was the base for pioneers exploring and settling beyond the Blue Ridge. 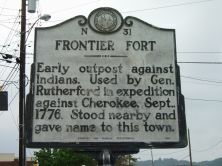 Numerous skirmishes between pioneer settlers and the Cherokee occurred near the frontier fort. During the Revolutionary War, it was a part of the Salisbury Military District under the command of General Griffith Rutherford. Rutherford and his militiamen rendezvoused at the fort in September 1776 during his expedition against the Cherokee. Since first settling in the Blue Ridge Mountains, pioneer settlers had lived in fear of the Cherokee Indians. The Cherokee had allied themselves with the British and had attacked white settlers in the western parts of North and South Carolina. To put an end to the attacks, Rutherford led a militia of 2,500 men in a “scorched earth” march. The “total warfare” tactic was made most famous by General William T. Sherman during the closing weeks of the Civil War. By the end of the expedition, Rutherford and his men had burned and destroyed thirty Indian towns. 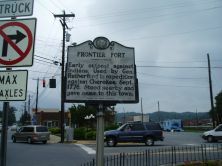 In 1870, the town where the frontier fort once stood was incorporated as Old Fort. In 1930, the town erected a large, stone arrowhead marker commemorating the site of the fort. Its inscription reads, “This marks the site of the Old Indian Fort built A.D. 1756, the western outpost of the United States and North Carolina until 1776.” The ceremony held to dedicate the marker celebrated the peace that had been achieved between the Indians and the white population living in the area.